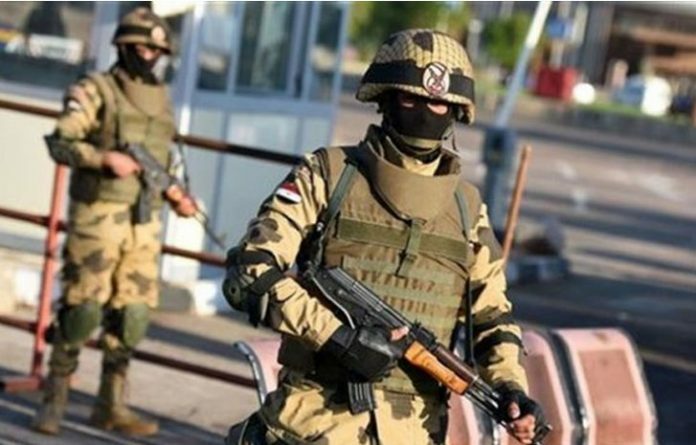 Six suspected militants were killed by Egyptian security force in a raid on their hideout in a suburb west of Cairo, the interior ministry said on Monday. The interior ministry said it had received information that the suspects were planning attacks on important installations, Churches and security personnel during the (Muslim) Eid al-Adha celebrations. Security forces found assault rifles, shotguns and ammunition during the raid. The ministry published photographs of bloodied bodies with their faces masked and the weapons on the floor beside them. The alleged extremists died in a shootout after opening fire on security forces in the 6 October district, according to the statement. The raid in the 6th October suburb came just days after an attempted attack on a church near Cairo. Security forces arrested seven people suspected of involvement in Saturday’s foiled bombing, the latest attack aimed at Egypt’s Christian minority. Separately, Egyptian forces killed 12 suspected militants in raids in North Sinai, as reported on Sunday. The statement did not specify when the raid took place or whether the suspected militants were affiliated with any specific terrorist group. The interior ministry announced Sunday that security forces had arrested six members of a “terrorist cell” behind that attempted attack. President Abdel Fattah al-Sisi has pledged to eliminate Islamist militants, who have killed hundreds of civilians and members of the security forces in the Sinai Peninsula in recent years. Several attacks have targeted the Egyptian mainland. The Eid festival takes place next week. Egypt usually tightens security measures before national holidays, around which several attacks have taken place since 2011. Egypt has long been a region with a lot of jihadist activities. Sinai particularly is used by militants as both a haven and a crossing point for smuggling fighters, weapons and illicit goods. According to Khaled Okasha, an Egyptian security expert and a member of a government council to counter terrorism and extremism, the geographical structure of Sinai makes it easier for militants to hide and is extremely complex to control. Egyptian security forces can only deploy very limited equipment and troops there because the area is supposed to be a demilitarized buffer zone between Egypt and Israel. The rate of terrorist attacks by Wilayat Sinai (Egypt ISIS) and other Islamist militants has been rapidly increasing to cause political instability and chaos. Targets of these militants in Egypt have included government officials, police, tourists and the Christian minority. There is a general concern about how the Sinai Peninsula could become another sanctuary for the Islamic State to carry out operations throughout the Middle East. Wilayat Sinai could help facilitate more attacks in Egypt as well, adding extreme political instability in the country. Its existence also poses a threat to Israel, which shares a border with the Egypt and has frequently intercepted rockets from the region. In consideration of safeguarding the nation, eliminating the terrorism requires an accurate identification of the information as the name and pictures of militants, exact hideout location, number of militants involved and other relevant information about the militants in the region. Due to geographic/ political challenge, existing conventional methods such as surveillance and informant tips prove time-consuming and risky, reliable and authentic intelligence is an essential part of solving this complicated enormous case. The present situation indicates that law enforcement agencies should enhance their methods and strategy by embracing modern forensic technologies in the war against terrorism both domestic and international. Advancements made in neuroscience provide counter terrorism agencies with a breakthrough solution for investigatory practices. Brainwave Science‘s iCognative is the only existing contemporary forensic technology that out-performs in terms of portability, accuracy, ease of usage and has proven track record to provide results and leads with an accuracy of 99.9%. The technology uses an active human brain to specifically extract information and gain accurate intelligence and identification of militants and hideouts. iCognative is a cost-effective, non-invasive modern forensic technology, that has the extraordinary ability to distinguish between terrorists and innocents by measuring brainwaves. This innovative investigative solution is beneficial in various investigative disciplines, including Law Enforcement, Border Security, and Counterintelligence, providing accurate results for interrogators across the globe. In the case of eliminating militants in Sinai, Unit 777 can use a 45-minute iCognative test to determine if arrested militants have any specific knowledge of any fact or situation, such as the future planned attacks, key members of the organization, information about ISIS, exact location of hideouts, route, and other undisclosed information. In order to conduct a iCognative test on suspect or person of interest relevant to the crime, a test case needs to be built using crime related known and confidential information known only to the perpetrator and investigators called stimuli. It only takes 15 minutes to enter the stimuli into the iCognative system. Stimuli can be in the form of words, phrases or pictures depending on its availability. For example, in this case, investigators can use stimuli as: hideouts, ISIS connections, detail of weapons, future attacks along with other confidential information they have collected during an investigation as stimuli. All this information will be flashed one after another on a computer screen to the suspects while the iCognative system collects brain responses to each stimulus. These responses are analyzed by a click of button by the automated proprietary software to give final analysis with 99.9% accuracy. There are two conclusions, information in question is present or absent in the brain of the suspect. Once the iCognative test is conducted, it can be accurately determined whereabouts of these militants, name and picture of other militants, future planned terrorist attacks and the mastermind of this network. Once such information is gained, eliminating terrorism is the easy part. iCognative sets the benchmark for innovation and performance as it is an exceptionally advanced, non-intrusive, and affordable security solution, posing great value for counter terrorism.